Ang Dating Daan (The Old Path), the longest running religious television and radio program in the Philippines, hosted by International Televangelist Bro. Eli Soriano, commemorated its 38th anniversary in a week-long celebration held from December 10-14, 2018. With the help and mercy of God, Ang Dating Daan did not just celebrate another year in broadcast, but also in public service and in making an impact on people’s lives through numerous charitable works continuously upheld by the Members Church of God International (MCGI), the religious organization that produces the program. Take a look at some of the program’s highlights and milestones in public service and broadcast throughout the years. “Top Donor Award” in the Religious Groups category from the Philippine Red Cross (2014). Meanwhile, in July 2018, the National Trades Union Congress (NTUC) Health, a nursing home and senior care provider in Singapore, recognized MCGI as one of its active partners in organizing wellness activities for the elderly. MCGI, alongside its media partner UNTV, was also awarded by the Filipino Community Council of Australia (FILCCA) in October 2016 for supporting the latter in its advocacies by organizing regular blood donation initiatives, clean-up drives, and visits to eldercare facilities in Australia. 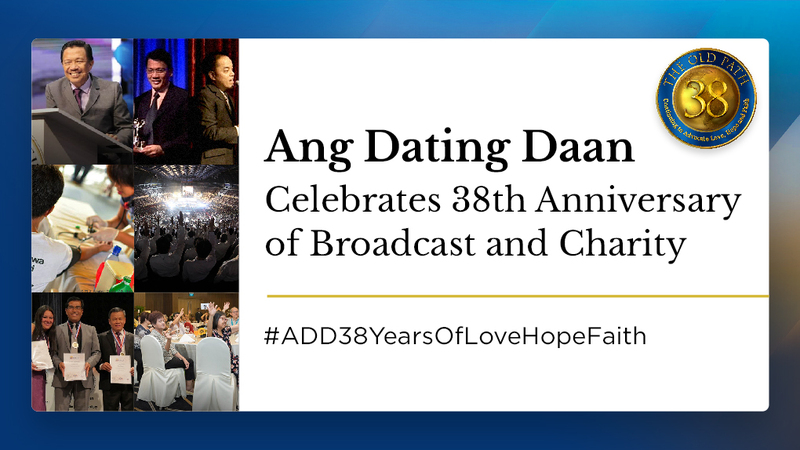 Ang Dating Daan has also reaped awards and commendations throughout the years in broadcast since it first aired in 1980 as a 30-minute radio show in the Philippines. UNTV News and Rescue, headed by MCGI Assistant Overall Servant Bro. Daniel Razon, was also hailed as the “No. 1 Television Station Committed to Truth and Genuine Public Service.” Ang Dating Daan airs on UNTV and its AM radio arm Radyo La Verdad 1350. In 2006 and 2011, Gawad Amerika honored the program as the “Most Informative Religious Program” and “Best Religious Program”, respectively. Gawad Amerika is an independent award-giving group that recognizes the achievements of Filipino-Americans and outstanding Filipinos. It started as a civic organization called the “Gawad Amerika Foundation” founded by Charles Simbulan. Gawad Amerika is known and respected both in the Philippines and the United States for its commitment to community service. Apart from these broadcast industry recognitions, Ang Dating Daan also holds the Guiness World Record for the “Largest Gospel Choir”. The Ang Dating Daan Chorale – composed of MCGI members – bagged the award during the program’s 35th anniversary in 2015. Guinness World Records Adjudicator Fortuna Burke Melhem was present during the event held at the Smart-Araneta Coliseum to present the award.